The official description for Bejeweled Stars does not read “You like Candy Crush Saga? Fine. Here’s your damn Candy Crush Saga,” but it really should. PopCap’s Bejeweled wasn’t the first match-three puzzler, but it was the game that put the sub-genre on the map. The wonderfully simple, wildly addictive gem-matching game grew so popular there was a add-on that made it playable within World of Warcraft. But then 2012 rolled around and suddenly match-three gamers didn’t want simple and relaxing anymore. They wanted sequential levels and power-ups and colorful characters and all sorts of complicated game mechanics. They wanted Candy Crush Saga. Within a year of Candy Crush Saga’s release games that were once referred to as Bejeweled clones were being labeled Candy Crush clones. King’s game became the default example of mobile match-three gaming. Bejeweled Stars is here to take back the crown. Watch. Bejeweled Stars is basically PopCap taking their beloved franchise and putting it into a format that today’s casual puzzle gamers are familiar with. Instead of a simple field of gems we’ve got a series of numbered levels. Instead of relying on the pure joy of gem-matching as motivation, players must aid Felis the StarCat and Corvus the StormCrow collect stars and return them to the sky. The game takes the star ratings that mobile games have been fumbling about with for years and uses earned stars to complete constellations, which earns the player new power-ups. 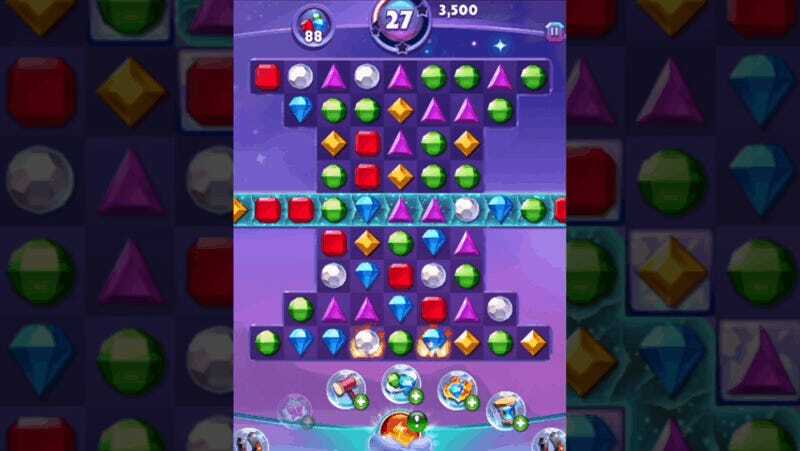 PopCap packs a ton of extra stuff into Bejeweled Stars, raising it above the level of your basic Candy Crush Saga clone. There’s a power-up crafting system, in which players collect special gems obtained while playing and use them to create the sort of things you’d generally just buy in these types of games. There’s a collectible charm system. Unlocking charms won in chests or by completing special challenges earn rewards like bulk crafting materials and extra in-game currency to spend on extra moves and the like. Plus look at that cat. He’s adorable. The whole affair feels like a deeper, more refined version of the game the competition has been pumping out in slightly modified form over the past several years. The puzzles are more challenging and rewarding. The extraneous bits are more entertaining and worthwhile. It’s as if the EA-owned PopCap had been on a bit of a Bejeweled nap, woke up, realized Activision now owned Candy Crush and decided it was on. Bejeweled Stars is now available as a free download for iOS and Android devices.